Wilderness drop camps provide an outstanding approach to get out west and experience the ultimate thrill of big game hunting. Drop camps afford hunters the opportunity to pack deep into wilderness areas without the fatigue, small weight constraints, and lack of amenities associated with backpacking. A lower price tag is another reason hunters opt for a drop hunt instead of a guided hunt. To be a successful drop camp hunter you must also spend a great deal of time planning your adventure and preparing yourself as well as your gear. You have chosen an outfitter and have scheduled a wilderness drop camp for the upcoming big game season. Now what? This is a question that many hunters have and many times they never find an answer. Not knowing what is expected leads to a lack of preparedness, which then oftentimes leads to an unsuccessful hunt. Outfitters generally provide you with a checklist. This checklist is generally the answer to all of your questions. The checklist should inform you of everything the outfitter supplies and recommendations of what you should bring. It is especially important that you read and understand the checklist. If you do not understand or have questions call your outfitter and get clarification. Not only does the checklist have recommendations of what to pack but it also states how it should be packed. You must remember that all of your gear, food, and other supplies are going to be packed in on horseback. This means that special attention must be paid while packing so everything arrives intact. Usually each person in your hunting party is allowed 1 duffel bag, 1 sleeping bag, 1 small sleeping pad, and1 cooler or dry tote. Duffel bags should be standard army size weighing no more than 50 pounds. Oversized bags don’t pack well. A good sleeping bag and pad to sleep on is essential. 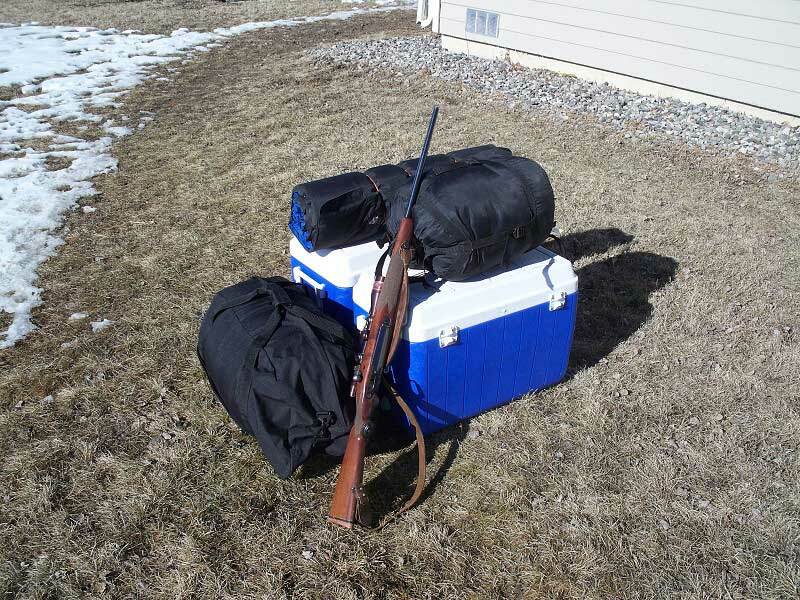 A week of freezing in your “blue light special” bag will certainly not leave you with good memories of your hunt. A foam pad or small inflatable pad will not only provide extra comfort it will also insulate you from the cold air beneath your cot. 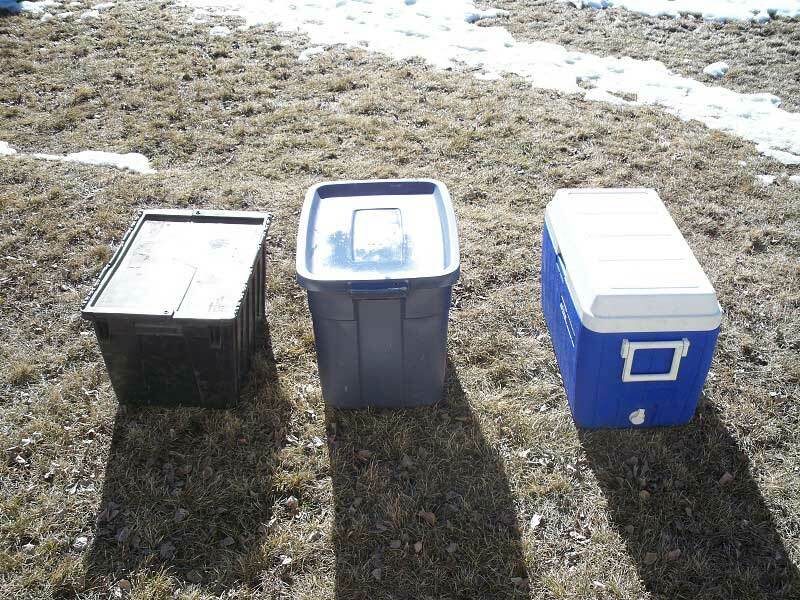 Pay particular attention to any restrictions on cooler or dry tote size. These items are the most difficult items to pack. 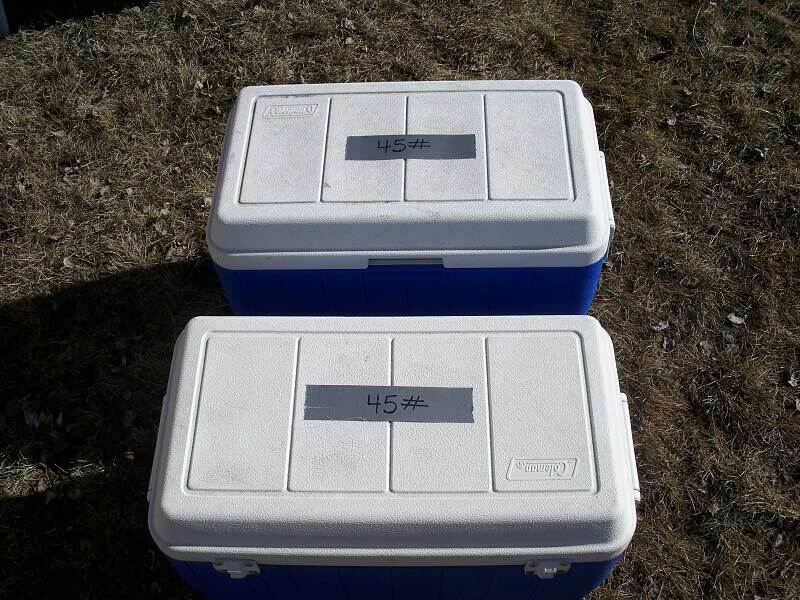 Standard 48 quart coolers and totes work the best. Your packer will oftentimes refuse to pack oversize coolers. Smaller coolers also are a challenge to pack. Freeze dried foods work excellent for drop camp hunting. They are small and light weight to pack. Cooking and cleanup is also quite easy. Make sure all of your gear is packed and ready to go before you arrive at the trailhead. All of you gear and groceries need to be packed in a cooler or tote box. Remember all of your gear is going on the back of a horse. When packing a horse everything must be in balance. Get together with someone in your hunting party. Weigh and balance your coolers and duffel bags to equal weights, and your packer will be impressed. Remember your packer knows the country and the game you are after. Take care of him by having your gear ready and organized, and he just might tell you about his favorite honey hole. Your next step in preparing for a wilderness drop camp is to learn the terrain and game you are seeking. Ask your outfitter for the general area you will be hunting. Purchase topo maps of the area and study them. Sometimes outfitters supply topo maps of the area as well as GPS coordinates to good hunting areas. If your outfitter does this make sure you take advantage of it. Studying maps will help you learn the area without actually being there. Google Earth is also a great tool to help you study the topography. Take time to study maps and aerial photos often. Find places you think game might travel then find different ways to get there. Without a trusty guide at your side that is an expert on the landscape a map will be your best companion. Get in shape! I cannot emphasize this enough. Hunting elk and mule deer in west is not easy. The mountains are steep and the air is thin. High altitude is hard to get used to. To be successful you will have to train hard and train often. Start now. Every day you procrastinate the harder those mountains will be to climb. Don’t think you can just show up. Those that don’t prepare physically spend most of their time in camp complaining about how hard the hunting is. Being in shape is especially important in a drop camp because your only mode of travel is on foot. You are going to have to be in shape to hike into areas where the game is at. Otherwise, you will be in camp wishing you would have spent the time preparing. And as a side note, not many elk are killed in camp. Get your pack and load it with all of your hunting gear and a ten pound weight to compensate for the altitude. Then head to the park or the steepest hill you can find and go for a hike. This is a great exercise to prepare yourself. Make it a point to do this at least once a week. Now the bad news. No matter how hard you train it is near impossible to get your body ready for the high altitude. Make sure to take it easy the first couple of days and stay hydrated. It will take 3 times the fluids you normally drink to stay hydrated at high altitude. If you overexert yourself on without letting your body adjust you may get altitude sickness or at least a headache and nausea. However, the good news is the more you prepare your body the easier it will be to adjust to the altitude. Get in shape! Now, if you have followed my advice so far. You are greatly helping your chances along to have a big bull elk on the ground. And when you do you need to be ready to take care of the animal so your packer can pack it out for you. Once the animal is down the work begins. It is your responsibility to gut skin and quarter the animal leaving minimal waste. Also you will be responsible to get the game to a location where the packer can get his pack animals. Everyone has their own way of taking care of an animal, and there really is no set way that it must be done. The most important thing to remember in the wilderness is, everything goes in and out on horseback. The horse’s load must be balanced. So if you chose to debone the animal have game bags ready and fill them equally. Also don’t overfill them. No more than 70 pounds in each. Or if you quarter the animal make sure the quarters are even. Game bags are the best way to protect the meat. Hang the meat in a cool creek bottom and it will keep until your packer come to pack it out. Remember to be a responsible and ethical hunter and waste as little meat as possible. Wilderness areas a remote and you never know what dangers you will face. When your outfitter drops you off make sure you have worked out an emergency plan before he leaves. Know what you should do if there is an emergency. Generally it is best to head down the trail and find help. Ask if there are any other camps nearby. If you are using radios let the outfitter what channel you use. Make sure you have something to write on to leave a note should you have to leave to find help. I recommend renting a satellite phone for the week. They are not to terribly expensive, and could be your lifeline in an emergency. Your outfitter should have a first aid kit in camp, but if not you should have one in your pack at all times. Accidents rarely happen but if one should happen you want to be prepared for it. The camp your outfitter has set up for you probably had hunters in it the previous week and will probably have another group when you leave. Make sure your camp is clean. Great care was taken so it would be clean when you arrived and it should be left that way. Make sure you wash all of your dishes. Not just the top plate in the stack. Don’t laugh. It happens at least once every year. Burn what trash you can and bag the rest. Smash all of your cans before bagging them. This will make trash easier to pack out. Keep in mind you are in the wilderness which are strict conservation areas. Leave no trace that you have been there and keep the wilderness as pristine as possible. Know what time your packer will be there to pack you out and be ready. Follow the same guidelines listed above for packing in. Everything packed away and organized. 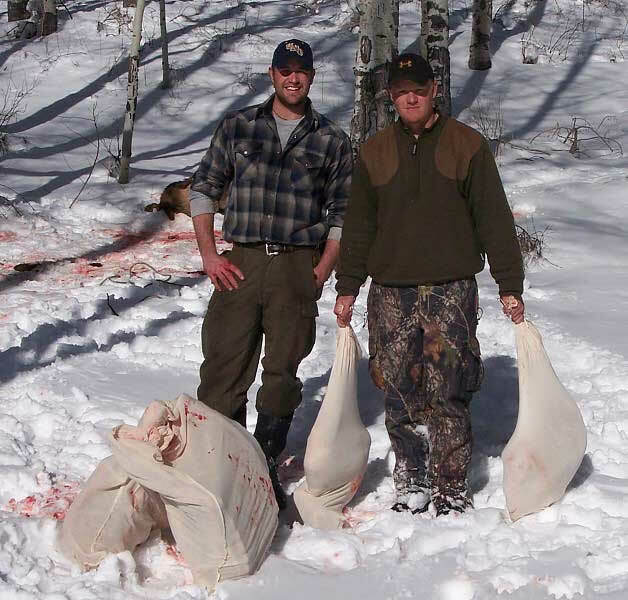 Wilderness drop camps are a great way to experience western big game hunting. Spend the time preparing: yourself, you gear, the terrain, and your trip should end with antlers on the wall and meat in the freezer. But most important, the opportunity to experience mother nature and her boundless beauty and resources.